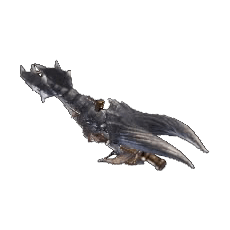 Griffon Blazooka is a Heavy Bowgun Weapon in Monster Hunter World (MHW). All weapons have unique properties relating to their Attack Power, Elemental Damage and various different looks. Please see Weapon Mechanics to fully understand the depth of your Hunter Arsenal. Griffon Blazooka has 3 different upgrade levels. It follows the Bone path, detailed below. Griffon Blazooka is part of an upgrade path for the Heavy Bowgun Weapon Tree. Below is an excerpt of the relevant Diablos tree. Highest attack non-elemental HBG makes this weapon tremendously effective with elementless decoration + 4peice nergo armor and xeno gloves, and gemmed "slugger" decorations, deals excellent damage and a well placed wyvernsnipe can knock down even the largest tempered monsters. I have a question regarding in this weapon. So I couldn’t help but notice certain monsters getting KOed a considerable amount with this weapon. Using the single shot. So does this happen with the other heavy bowguns Also if it does is it worth at all taking slugger gems. Finally does shooting the enemy in the head cause exhaustion and if so is it worth taking drain gems? Is this weapon any good?